Alaska To Build A State-Owned Gas Pipeline? The state of Alaska is considering a more aggressive approach to oil and gas development in order to make up for its collapsing revenue. Alaska relies on oil and gas to fund 90 percent of the state’s discretionary spending. With oil prices half of what they were last summer, Alaska’s tax collections from the industry are down 80 percent. Not only are prices down, but production continues to slowly decay as well (see chart). With Alaska’s finances in ruins, the state government is actively seeking ways to revive oil and gas development. The Governor and state legislature, along with its delegation to the U.S. Congress, have loudly called for opening up parts of the state under federal control, as well as the offshore Arctic. Related: The Easy Oil Is Gone So Where Do We Look Now? Governor Bill Walker is also very enthusiastic about TransCanada’s plan to build a tar sands pipeline from Alberta to the Alaskan coast. But now the Walker administration, growing impatient, wants to take a more aggressive approach. Governor Walker has called for the consideration of an expanded natural gas pipeline that could link up to a liquefied natural gas (LNG) export terminal. The Alaska Stand Alone Pipeline (ASAP) was originally designed to serve in-state residents with natural gas supplies. But the governor wants to look into the construction of a larger pipeline instead in order to export the gas. Crucially, he wants the state to take ownership of the project, a move that he says could boost state revenues. The project is seen as a fallback option should a proposed public-private partnership with oil majors not move forward. The Alaska LNG project is a massive LNG export proposal, with the backing of ExxonMobil, BP Alaska, ConocoPhillips Alaska, and TransCanada. 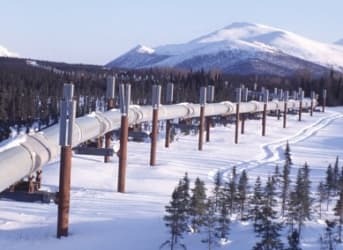 The project would consist of an 800-mile pipeline to connect gas fields in the North Slope to a liquefaction plant on Alaska’s southern coast. The state of Alaska has already agreed to take a 25 percent stake in the project. But with a price tag of $45 to $65 billion, the oil majors are certainly going to think twice about leveraging such a steep sum. All of them have recently committed to major cutbacks in capital expenditures in order to ease the pain of falling oil prices. Plus, LNG markets have soured since the project’s original inception. While the project may be a luxury that the oil majors cannot afford, Governor Walker is prepared to move forward without them. Governor Walker supports engineering studies for both the ASAP pipeline and the Alaska LNG project, with a decision made at a later date to move forward on one of them, or to merge them together into a single project. Financing and building a state-owned natural gas pipeline that could lead to exports could provide Alaska with additional revenues, but it also exposes the state to a higher level of risk. That has some Republicans in the state legislature wary of the Governor’s push. “I don't personally think that Alaska should own 100 percent of that project and take 100 percent of the risk,” Alaska House Speaker Mike Chenault said in response to the proposal, according to E&E ‘s EnergyWire. With demand for LNG in Asia dimming a bit over the last year, major public outlays for a large gas pipeline do indeed open up the state to more risk. The proposal also highlights the dangers to petro-states. Already heavily dependent on oil and gas revenues, Alaska is now looking to double down on a strategy that has it increasingly resembling the dysfunctional oil export nations from around the world. With government-controlled national oil companies (NOCs), these petro-states suffer from booms and busts, and are at the mercy of the price of oil. But with such an overwhelming share of state revenues coming from this single source, Alaska’s Governor sees no other option but to make a bigger bet on oil and gas. What On Earth Are We Doing Looking For Oil In The Arctic? What an interesting decline rate... think that's how Saudi Arabia will go? I wonder if Alaska would be interested in becoming the premier provider of Electrical power based on the new technology that requires no fossil fuels or solar to produce an unlimited supply of renewable energy? LNG has its problems. Why not https://en.wikipedia.org/wiki/Gas_to_liquids ? Gasoline & other liquids are easier & cheaper to transport, and the real fuels market is for liquids for transportation. Or plastics production, a value-added proposition. The AK north coast isn't really navigable, and 800 miles of large-diameter pipeline is expensive and not defensible, and an excellent target for whatever.